You will want to try this French Apple Gateau recipe if you love the sweet taste of baked apples! This unique "cake" calls for nothing but apples and a tiny bit of spice. Yes, it does call for a long baking time, but it's well worth the wait. The thinly sliced apples are compacted and reduced to a sweet, nearly candied state. Try it and you'll shout, "J'adore ce gâteau de pommes!" This is not your usual French apple cake recipe. This French apple gateau recipe is so SIMPLE it cannot really be called a recipe at all. It almost takes more time to describe it than to make it. Get approximately 5 pounds of apples. Any kind will do but I like red varieties (such as McIntosh). Green, tart baking apples (such as Granny Smith) yield a stiffer and whiter gateau that is very pretty, but it's not as sweet. 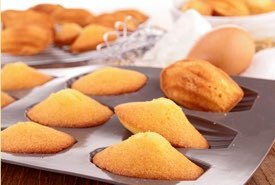 In a soufflé dish, oil the bottom with vegetable oil. Put parchment paper or foil on the bottom. This will aid in release later. Then put a wide strip of foil on sides of dish to add height to the soufflé dish. You need as much height as possible (3 inches or more) because this thing will shrink to less than half its height. Peel and core the apples (save the skins). Slice thinly (very thin) wafers of apple. A mandoline slicer makes the chore of slicing the apples easier and quicker. Layer each piece flat in the dish, in a slightly overlapping circular pattern, carefully building a flat and uniform layered structure. Fill the dish above the rim leaving as few gaps as possible. Boil in a saucepan the apple skins (just covered with water) and add a few tablespoons of sugar, some cinnamon, some nutmeg or cardamom is also good. Add a few slices of ginger as well for a nice flavor. Also, a squirt of lemon juice or a bit of orange juice or orange liqueur is nice. When the skins and water have reduced to a thin syrup, strain and press the skins to get as much color as possible from them. Pour this syrup onto the apples. Put a piece of parchment paper or foil on top of the apple slices, then place a plate on the top (upside down). This plate will sink into the soufflé dish so make sure it's a little smaller in diameter than the soufflé dish you use. Stack some bowls or plates on top of the plate for a bit of added weight and pressure. Bake this whole thing at 175°F. The gateau will leak sometimes, so it's a good idea to have a pan to catch dripping in the lower oven rack. It will take up to 14 hours to render this into a perfect jelly! The resulting hot apple gateau must be at room temperature when you invert it and remove it from the soufflé pan. First peel off the foil, then using the plate to hold it, turn the pan over and jiggle it a bit. The gateau will come out. Then slide it gently onto a serving platter. 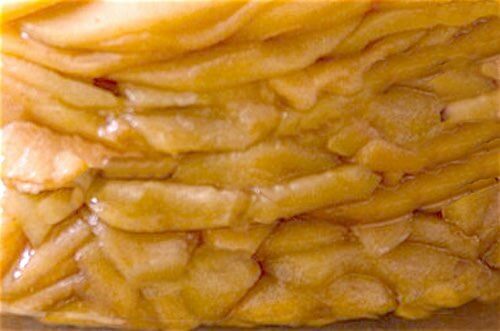 One variation to this French apple gateau recipe is to place your gateau between blind baked crusts (pre-baked crusts). One way I have done this was to prepare two flat crusts while the gateau was cooling. The crusts are plain pie crust pressed to the bottom of a spring form. Some dry beans placed on top for weight while baking help to keep the crusts flat, and 20 minutes later you have two crust discs. Then, you would place the gateau onto one crust, and top with the other. However, I often serve the gateau sans crust and rather make a caramel topping by reducing brown sugar in water with some ginger for flavor. The caramel is poured over the entire gateau and then crusted with almond chips. I also always prepare a whipped cream and yogurt topping by mixing 1/2 whipped cream and 1/2 plain yogurt. This 1/2 and 1/2 topping is unsweetened because the apple gateau is so sweet with the caramel and itself being intensely flavorful, the cream topping is perfect without added sugar. The result of this simple apple gateau recipe is worth every minute of time and effort. 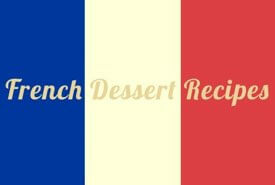 This is the most requested French dessert I have ever made!